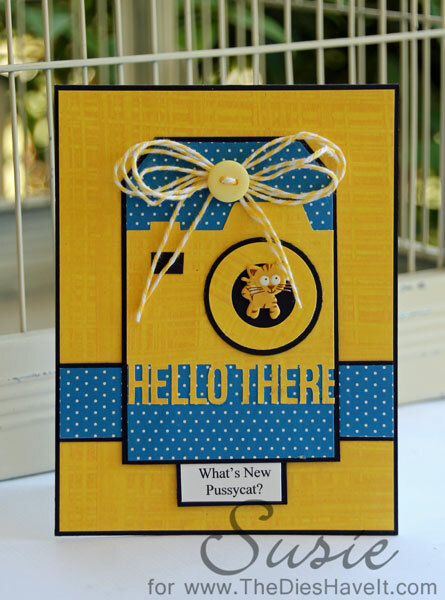 Created 4 Creativity : What's New Pussycat? I've been using my Silhouette Cameo more these days. I found this adorable camera cut file with the HELLO THERE sentiment attached. I just fell in love with it. I wanted everything to be bright on the card, so I grabbed some scraps and just started creating. I knew I needed one more thing, so I grabbed this cute little Eyelet Outlet Kitty Cat Brad and decided he should pop through the lens. And then of course came the tag at the bottom. So smile and have a wonderful Monday!